Review: There is a decent book hidden in this 700+ page monstrosity. Do editors still exist in the literary world? If so, how did they allow this to get published? I feel like at least 300 pages could have been edited out. 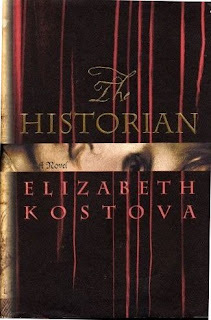 Kostova certainly knows her history (and food...she really likes to describe food) and while some of it was interesting, it was overall slow and boring. I'm a huge fan of the epistolary writing style but the letters were way too long to be believable (and no one remembers things from 20 years ago in the level of detail described). The ending was also a HUGE disappointment. After reading for close to 14 hours, most readers expect some big reveal, a huge climax, something we can sink our teeth into and think about. The 'revelation' about Dracula was laughable.